“The mission statement is to write an opening song for this next record that is super-thrashy and fast and aggro,” says drummer Lars Ulrich during the writing sessions. Due November 18, the two-disc set “Hardwired…To Self Destruct” was produced by Greg Fidelman, James Hetfield and Ulrich. “Hardwired… represents the next phase of our journey as Metallica and we are so excited to share it with you,” says the group. “This is our 11th studio album and is available for pre-order in a variety of configurations including 12 songs on a double CD, vinyl, digital download, as well as a deluxe version with the riffs that were the origins of the album. Metallica performed the live debut of “Hardwired” at the U.S. Bank Stadium in Minneapolis, MN on August 20 following its premiere two days earlier. 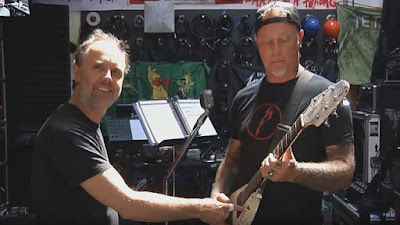 The follow-up to 2008’s “Death Magnetic” has been in the works for about a year as Fidelman joined the band in their Bay Area studio.